Horse drawn wagons built for the AIF prior to shipping to France c1917. Photo courtesy of Ian Duncan Smith. Right from the outset of the business James Duncan and James Fraser put great emphasis in promoting the partnership to the public. This theme continued until the company's closure; quality workmanship presenting value for money whether it be horse drawn transport, tram cars or motor car bodies. One way this theme was conveyed to the buying public was via public display of their products.For many years Duncan & Fraser wheeled their new buggies and horse drawn trams into Franklin Street for set photos. James Duncan under took a new business venture when the company became part of the "Patented Juilen Electric Traction Tram". James had been fighting continuously with other business partners for an Adelaide display after dismal orders from the Sydney and Melbourne showing. Duncan & Fraser and Adelaide were finally rewarded in 1889. Further details of this and other trams will be covered in other pages on this web site at a later date. The company practice was further extended to display their skills and craftsmanship in working demonstrations. The new 2 storey brick factory was completed and operational the Duncan's agreed that this was a great way to enhance the stature of the business. On 9th September 1908, for the first time Duncan & Fraser organised an "Open Night" to celebrate the electric illumination of the factory. On display were motor cars, trams and buggies in various stages of assembly. Part of the night's entertainment was the building of a buggy from scratch. Over 2,000 people came through the Franklin Street factory on the night and watched Alf Coyle, Richard Newell & Jack Thorogood and other senior tradesmen perform their crafts. Commencing at 7pm a complete "Abbot" buggy was built from raw materials to the finished article (excluding paint) in 2 hours 48 minutes. The night proved to be an overwhelming success and was the talk around Adelaide for many days after the event. The "Abbot" buggy built on Wednesday 9th September 1908 in 2 hours 48 minutes. Photo courtesy of Ian Duncan Smith. After the success of the first public demonstration it was decided that it needed to be repeated. However, it could not be done too often or the public may lose interest. By 1912 the new 2 storey factory had become too small due to the huge success of the South Australian state distributorship of the Ford motor car. 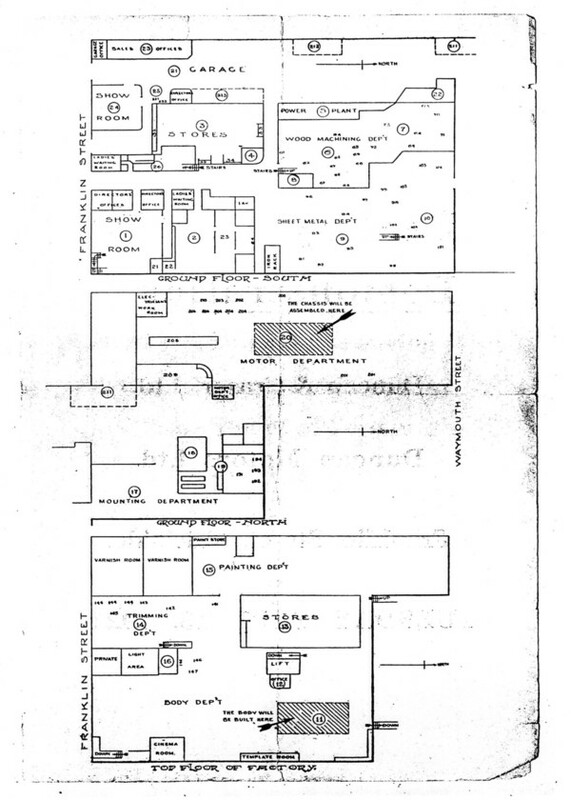 After the initial factory expansion the Duncan family was not in a financial postion to fund the much need extensions. The Duncans made the business decision to raise the capital required for the factory improvements not by borrowing the funds from a bank but by way of public subscription. 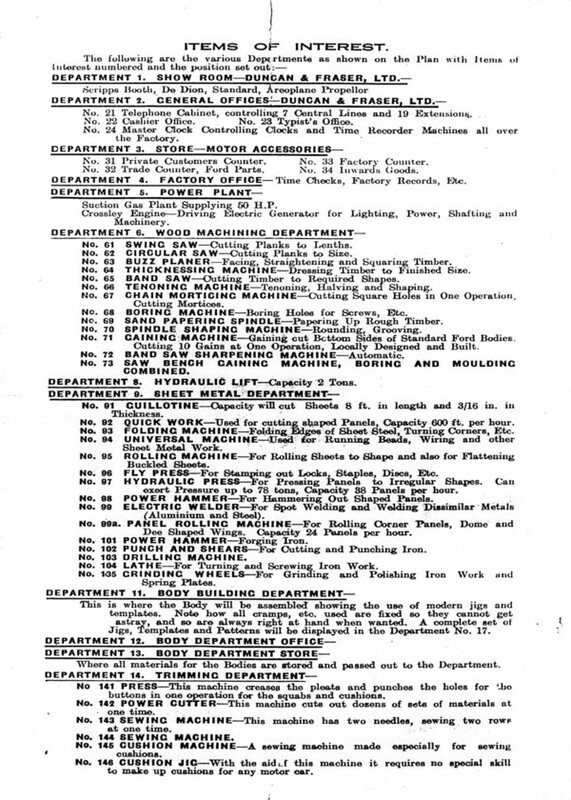 The profile of the company needed to be raised and after the success of the first public demonstration in 1908, it was decided that it should be repeated. On Wednesday 11th September 1912 in celebration of the announcement of the public float the company built another buggy at their Franklin Street premises. Out on the foot path over 4,000 people watched once again the senior tradesmen perform their craft, Alf Coyle and Jack Thorogood amongst them. Unfortunately I have few details on the second public demonstration and no time or photo of the event. However, what is known is that although the event was hugely popular with the public it did not translate in the sale of shares in the company. 2 weeks later Head Motor Car Salesman S.A. Cheney undertook this duty himself and sold the remaining stock. By 1917 the war had been raging in Europe for over 2½ years. All shipping had been confiscated for the war effort and Duncan & Fraser Ltd. faced the continual shortage of new cars and lorries to sell. The company needed to be careful as they needed to advertise their wares and keep the company in the "public's mind", but it also had to not promote the virtues of the Ford too much for fear of failing to supply. It was a knife edge balance for the management team at the time. After the immense popularity of the previous two public demonstrations it was decided that another event would be good for the Adelaide public's spirit. This time it would be done with a twist and a Ford car would be assembled from spare parts. 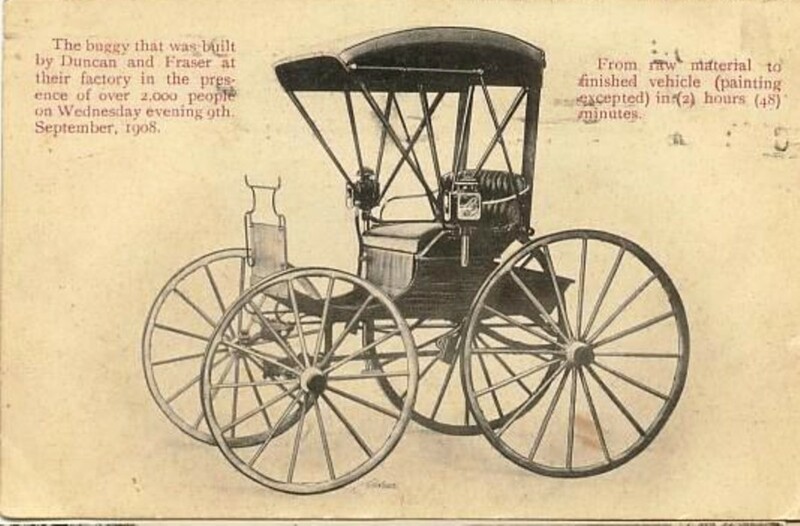 The building of a buggy was old hat, but the assembly of any car in public was new and had never been done before. The parts were laid in the factory, a plan of assembly drawn up and a team of willing volunteers was assembled. 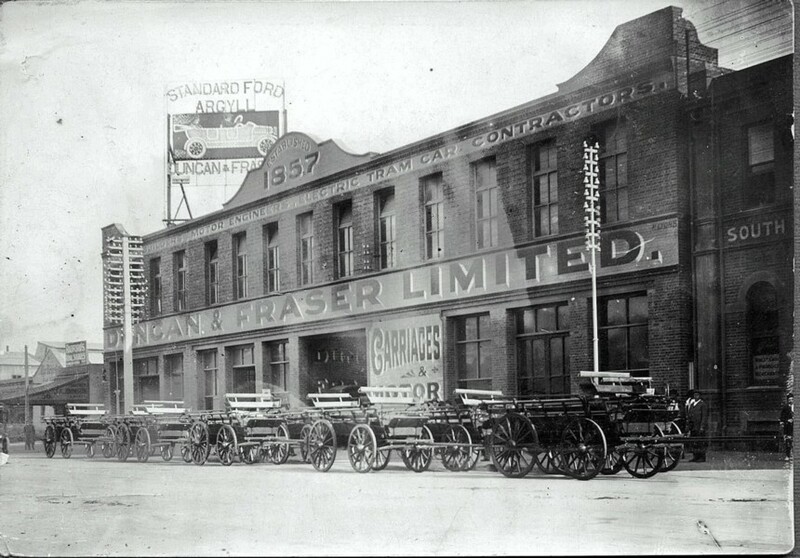 On Tuesday 11th September 1917 the talented craftsmen at Duncan & Fraser assembled a Ford motor car from spare parts including a "deluxe" body (except painting) in 2 hours 32 minutes outside on the footpath outside the Franklin Street factory. It was a huge success with the papers of the day reporting over 5,000 people attended the spectacle. 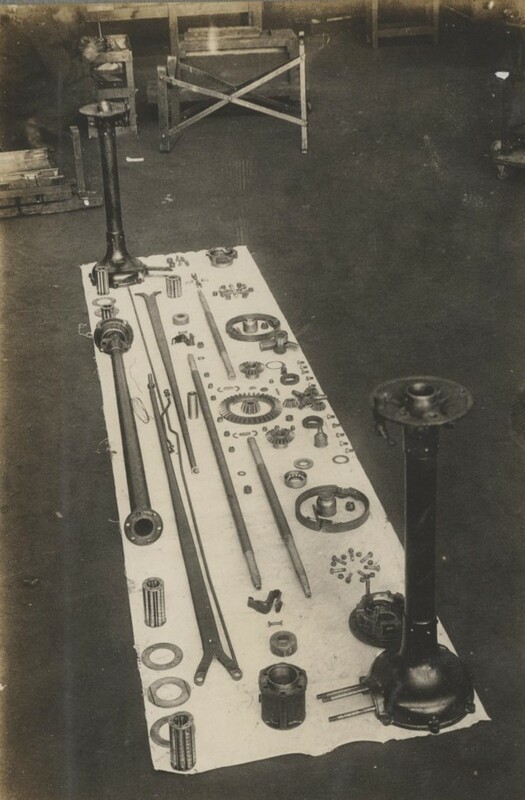 Ford engine components laid out ready including the crankshaft, cylinder head, pistons, clutch plates and a Holley 'G' carburettor, even the transmission was in pieces and assembled for the demonstration. 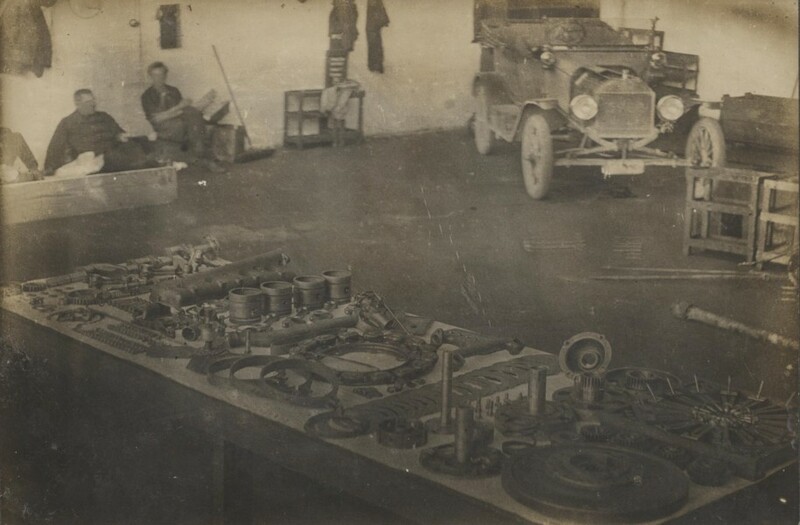 Note the 1915 model Ford in the background of the workshop. Photo courtesy of Ian Duncan Smith. 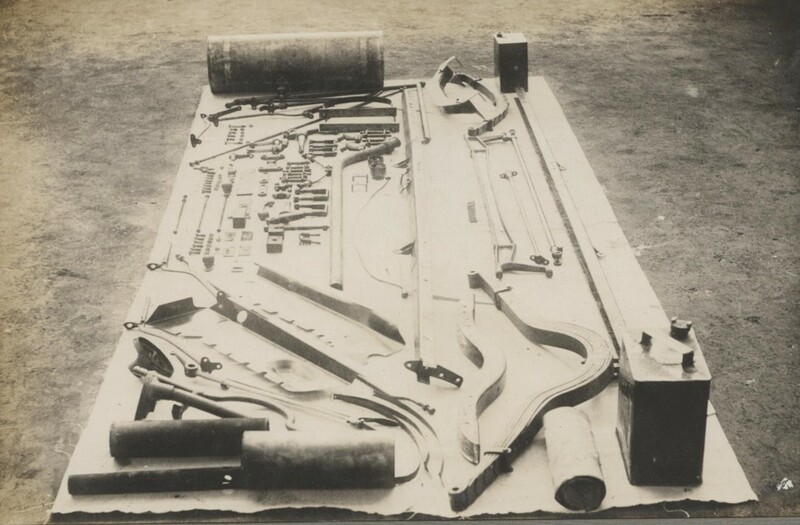 Ford chassis components laid out ready including front & rear cross members, front & rear springs, front axle, petrol tank, exhaust pipe, muffler and even accessory "Shell" 2 gallon petrol cans! It is interesting to note that even the chassis was in pieces and riveted together for the demonstration. Photo courtesy of Ian Duncan Smith. Windscreen stanchions, side lights, leather hides, upholstery materials, horse hair, seat springs, cast hood mechanism and wheels in pieces ready to be assembled. Wood has been cut up and in piles ready for the coach builders. Note the buggies in the background ready for delivery even at this late stage in 1917. Photo courtesy of Ian Duncan Smith. All of the parts needed to assemble a complete Ford rear end. Photo courtesy of Ian Duncan Smith. 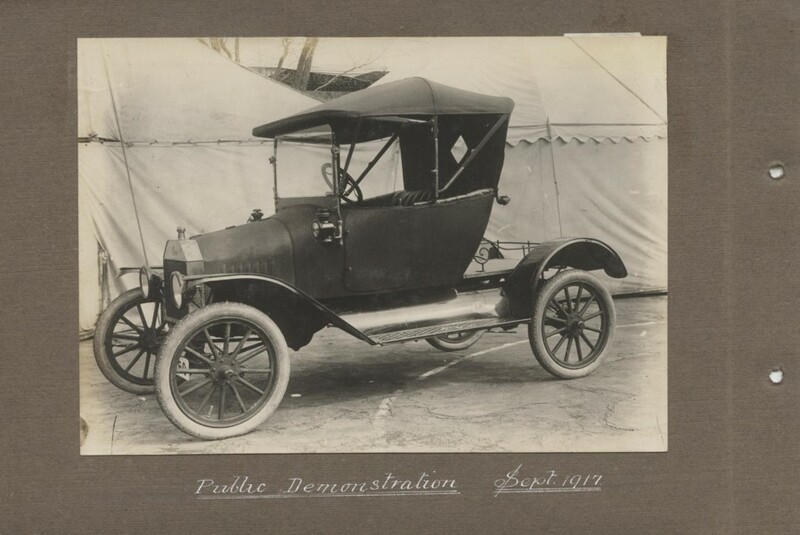 The "press" photo of the completed car still in the Duncan Family photo albums. 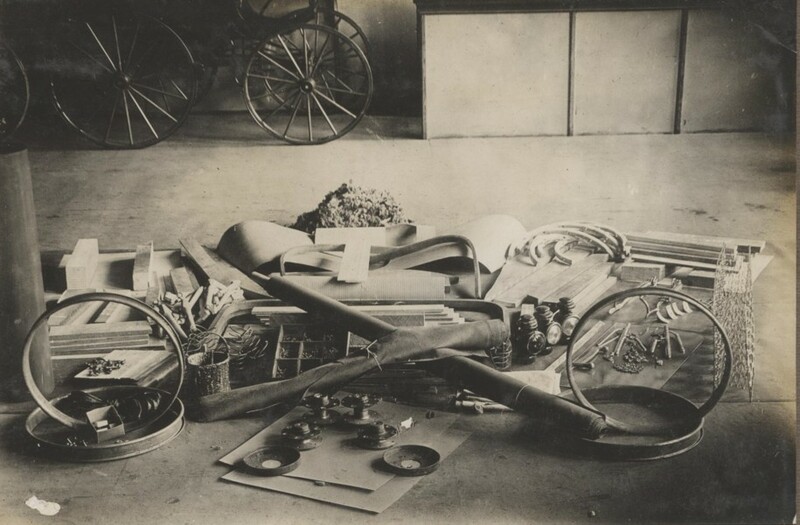 The car, a brass 1916 model was made from spare parts including building the body and trim (except painting) in just 2 hours 32 minutes. It is interesting that Duncan & Fraser chose to build a "deluxe" body reinforcing that the government's "Embargo" banning imported car bodies was well and truly having an impact. This "Spare Parts" car is the only brass radiator"deluxe bodied Ford that I have found with standard Ford mudguards. Note the simplified hand made bonnet made without the side hinges and only 7 vents instead of the customary 8 vents; again seen only on this car. It is apparent that some "shortcuts" including the flat rear deck were permitted for the demonstration. Photo courtesy of Ian Duncan Smith. The fourth demonstration was of a different nature with no advertising gimmicks or vehicles being assembled. 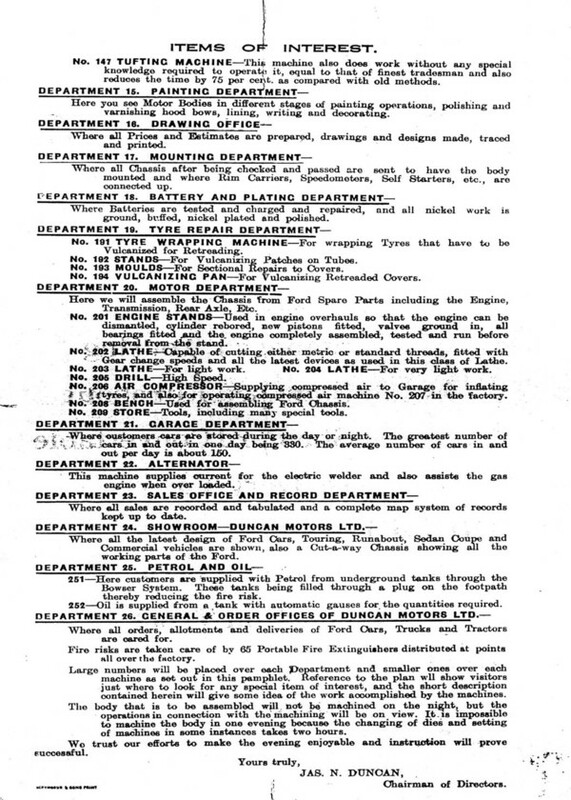 It was used to promote the new Duncan Motors Ltd. body released on 1st July 1921, the management of Duncan & Fraser opened up the entire factory for the public to see how these new bodies were being made. On 13th September 1921 the public came through the factory by the hundreds. Duncan & Fraser printed up a double opening program that not only explained the entire layout of the factory, department by department but lists every machine and their function including what they make and how many per hour. We are very fortunate than an original program survive today giving us a rare insight into the capabilities of the factory at the time. The reproduction this of document is courtesy of Richard Duncan. Do you have any more information on these events? Have you an old photograph(s) hidden away in those old, dusty family albums? 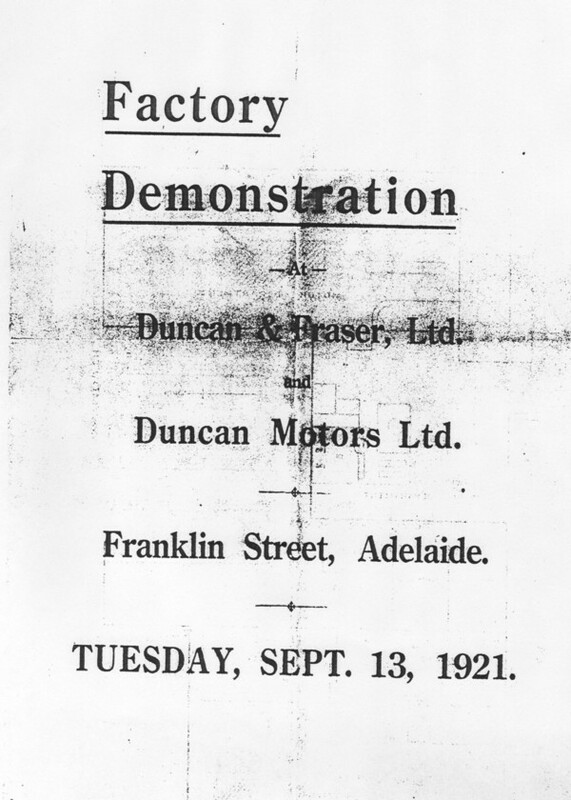 Do you have anything pertaining to either Duncan & Fraser Ltd. or Duncan Motors Ltd.? If the answer is 'yes' to any of these questions I would love to hear from you.